The Gerovital H3 Equilibrium vials contain a serum rich in pure and liposomal Hyaluronic Acid and Superoxide Dismutase (SOD) with strong effects in reducing wrinkle's number, lenght and depth and increasing the skin hydration. Hyaluronic Acid is one ingredient that works across the board, being very well tolerated by all skin types, even oily, sensitive or acne affected. 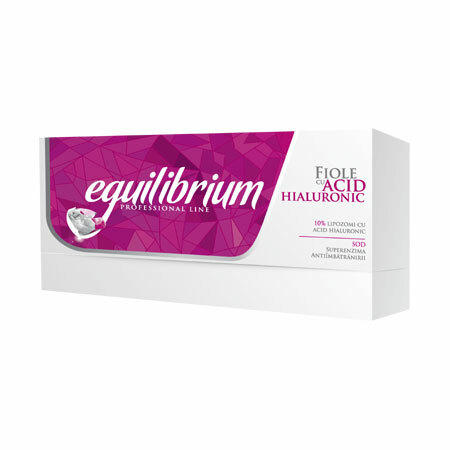 As part of the Gerovital H3 Equilibrium professional cosmetic regimen, the liposomal Hyaluronic Acid vials have been formulated to offer an almost instant solution for dryness, loss of firmness and elasticity, dullness or uneven skintone. Hyaluronic Acid is naturally present in large amounts in the spaces between skin cells, but our ability to produce hyaluronic acid declines with age, so that by our 50's the synthesis of hyaluronic acid is estimated to be as little as half of what is required. Hyaluronic Acid plays a critical role in skin health with its unique ability to restore the ideal level of hydration for the skin and reduce the trans-epidermal water loss (TEWL). Hyaluronic Acid is also a “smart nutrient” as it can adjust its moisture absorption rate based on the outside humidity—depending on the season and climate. When encapsulated in liposomes, the Hyaluronic Acid is more stable, more effective, having a greater penetration in to the deeper layers of the epidermis. The liposomes with Hyaluronic Acid are absorbed into the skin where they release the Sodium Hyaluronate which binds a large quantity of water in a tridimensional network, highly increasing its volume. Thus the wrinkles are filled from the inside and are smoothed and the skin becomes firmer. The anti-aging effect of the Hyaluronic Acid is enhanced by the Superoxide Dismutase (SOD). SOD repairs cells, protects the hyaluronic acid, the collagen and elastin fibers from the damage done to them by superoxide, the most common free radical in the body. Used regularly, SOD delays the signs of skin ageing: wrinkle appearance, dehydration, hyper-pigmentation or loss of elasticity. Usage: Recommended in the Oxygenation/Ionization phase of the cosmetic treatment. Once the serum is absorbed apply your face cream. For best results, use the appropriate moisturizer from the Gerovital H3 Equilibrium line. For optimum and long-lasting effects, apply this treatment every month as part of your professional cosmetic treatment. Markastore tip: For a visible boost, apply it as an intensive treatment for 20 days, twice a year. To maximize the effectiveness of the ampule’s active ingredients we recommend using a cosmetic device such as the Gerovital H3 Derma+ Anti-Wrinkle Activator Led & Ion Technology. Apply in humid conditions. This way, the Hyaluronic Acid will draw moisture from the air rather than deeper layers of the skin. Seal in the moisture immediately with your serum or moisturizer. Pour the ampule content into the palm of your hand and apply on the freshly cleaned skin by gently massaging it. INGREDIENTS: AQUA, GLYCERIN, PROPANEDIOL, PHENOXYETHANOL, SODIUM HYALURONATE, LECITHIN, PPG-26-BUTETH-26, PEG-40 HYDROGENATED CASTOR OIL, SUPEROXIDE DISMUTASE, CARRAGEENAN (CHONDRUS CRISPUS), CARBOMER, GLYCERYL LAURATE, PENTYLENE GLYCOL, TROMETHAMINE.